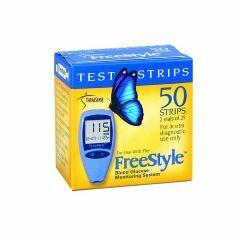 Stock up on Freestyle Test Strips to test blood glucose levels with the FreeStyle Blood Glucose Monitoring System. The easy-to-use TheraSense Test Strips allow people with diabetes to take a blood sample from multiple sites including their fingertips, forearm, upper arm, thigh, calf and fleshy part of the hand, eliminating virtually all the pain of testing. Dual target areas on both sides of the strip allows for easy filling from the right or left hand side. The package of FreeStyle Test Strips comes in 1 vial of 50 test strips. The Abbott Test Strips are affordable and easy to use. NOTE: 2 boxes of 50's may be substituted for this item. Reliable. Painless. Accurate. Compact. Easy To Use. Of all the diabetic meters that I have seen, this one requires the least amount of blood. Easy To Use. Fast results. Reliable. Painless. When our mom got sick we had to test her blood several times a day. Oftentimes she was sleeping and this system required so little blood, it was possible to test her without waking her up. The results come up fast on the freestyle meeter and the amount of blood it used was really small. The only test for me! Painless. Easy To Use. Compact. This is the only testing product I have ever used. I was diagnosed with Type II Diabetes about 5 years ago and I have always been satisfied with this product. I don't have anything negative to say about it!!! Easy To Use. Painless. Compact. Reliable. Easy To Use. Compact. Reliable. Accurate. These test strips are easy to handle, and require a minute sample, making the stick more superficial and less painful. can you use the free style glucose strips with the Alpha Trak 2 meter?Used for testing a cat's blood. Do You need to use the freeStyle tester? Do You sell THAT tester? are these strips safe-sealed up? Yes. Ordered and used 200 of these strips without a problem. Arrived in tubes within sealed boxes.